After a 6:00 AM alarm and a very good omelette breakfast freshly prepared by the staff at Howard Johnson’s, we hit the road to cover the 100 miles or so to the Lake Tahoe area. We’d seen a weather forecast on the TV in the breakfast area and, wouldn’t you know it, after weeks of wall-to-wall sunshine, the forecaster was now getting excited about the prospect of some rain in the mountains. Blast! (I want to live in a country that finds rain a rare and exciting prospect.) The rain was not expected until later in the day so we hit Interstate 80 anyway. Besides, we’d come half way and what else were we going to do? Interstate 80 beyond Roseville was much quieter and our drive up into the Sierras was relaxed and quite picturesque. 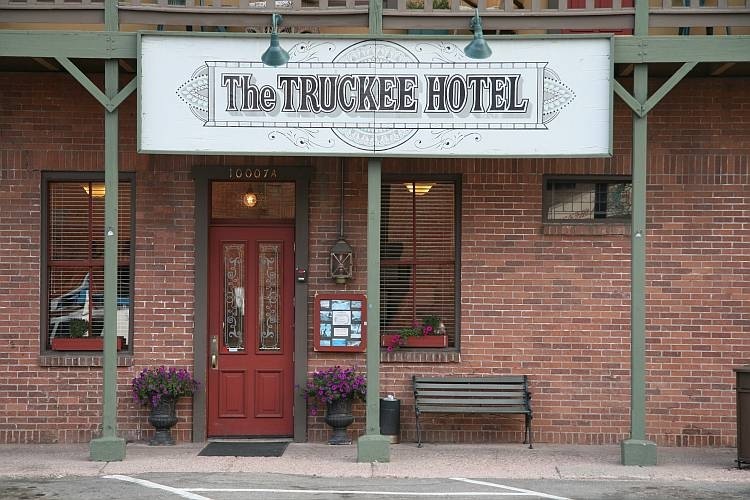 First stop was in Truckee to the north of Lake Tahoe. 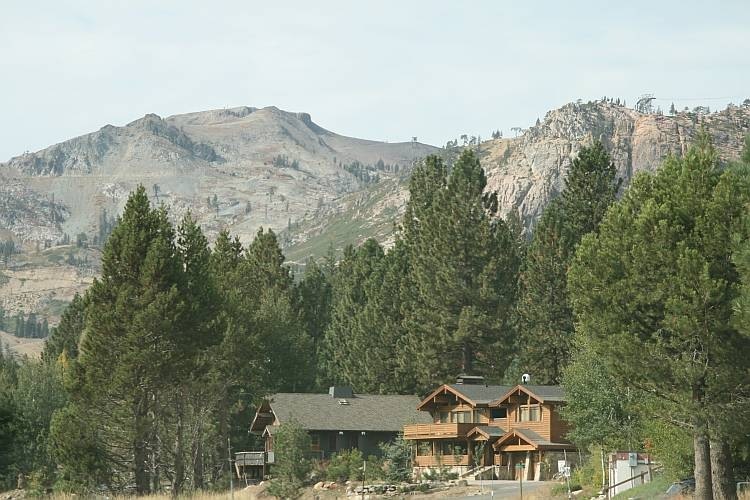 Here I had once stayed for a weekend’s entertainment in what I was told had been the old whore house in gold rush days. It was still only 9:00 AM so we popped in to a colourful local coffee shop to top up our caffeine levels. We also popped in to the local gas station to top up our technologically rich Camry’s fuel levels. The blasted automated machine insisted on my entering a zip code again but, this time, the cashier seemed to have enough smarts to circumvent this minor problem and we got filled up. Next stops on the way down to the west side of Lake Tahoe itself were the twin skiing areas of Squaw Valley and Alpine Meadows. The road up to Squaw Valley was quite alpine in nature and we were hoping to take a chair lift up to a highpoint for some expansive views. Unfortunately we seemed to have timed our visit between the summer visitors and the winter skiers so no chair lifts were operating. The road up to Alpine Meadows did not look at all alpine. I’d suggest, therefore, that these two ski resorts be renamed Alpine Valley and Squaw Meadows. Whatever the name, Alpine Thingy was equally closed. 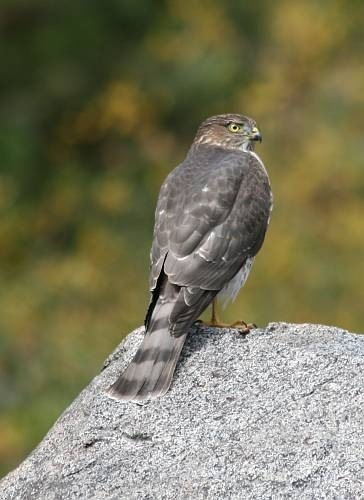 Fortunately a very obliging American Kestrel was sitting on a rock and, moreover, remained sitting on a rock while our technologically rich hybrid Camry drifted silently up to it on battery power for a photo shoot. Stalking wildlife; what an excellent use of battery-powered cars. At last we joined Lake Tahoe itself at Tahoe City. We found a parking spot to go “ooh, ah” at the lake and lo, a block of six restrooms beside a small local museum. Just what we were beginning to need. Frustratingly, we discovered that it was not only the ski resorts which were shut but also, it seemed, the restrooms. There was, however, a very helpful sign on the museum door declaring, “sorry, no public restrooms inside”. Splendid! The clouds were gathering and thickening as we made our way down the west side of Lake Tahoe pausing occasionally for a gander at the view which was mostly boat docks and boats. Our main goal was the much advertised Emerald Bay towards the south end of the lake. Its name, of course, derives from the apparent colour of the water in the bay. Beside the bay is the highly acclaimed house called Vikingsholm, the erstwhile summer retreat of some embarrassingly rich lady previously unknown to me. It was lunchtime and we had begun fantasizing about a little Mexican Taqueria, preferably overlooking the lake but we were willing to take anything. After about 20 miles and a couple of resort areas large enough to feature on a map, not only had we not seen an appealing Mexican taqueria, but we hadn’t seen a restaurant of any kind. We couldn’t believe it – tourist heaven with both summer and winter trade and not a restaurant in sight. Bloody brilliant! Eventually and still without having found anything beginning with “rest”, neither a restaurant nor a restroom, we arrived at a $6 parking area for Vikingsholm under looming grey skies. OK, we don’t mind coughing up for this one, let’s go take a look at Emerald Bay. Today the bay was far from emerald. Under the glowering skies, Emerald Bay had become Slate Gray Bay. It is undoubtedly a very impressive vista but the lighting on this day was certainly not going to do photographs justice at all. There were supposedly restrooms here but, like Vikingsholm itself, they were down a one mile precipitous track on the shoreline of Emerald Bay. I suppose given the other seasonal closures it was unsurprising to discover that Vikingsholm was due to close tomorrow as well. Nonetheless, we had arrived while it was open and, in the absence of any commercially available sustenance, armed with the remnants of our V. Sattui Winery picnic of yesterday, we set of down the track to see the residence itself and to find the longed-for restrooms. Vikingsholm itself was smaller than I had expected. I was thinking of something much grander. Still, it was only a summer retreat, I suppose. The most disappointing aspect was that the entrance was now covered in scaffolding. Bother! Now why, pray tell, if the place was closing to the public tomorrow, would they ruin everyone’s pictures with scaffolding? Couldn’t they have waited until after tomorrow? So, no quaint restaurants with lake views, pointless pictures of the bay because of the pants light, pointless pictures of Vikingsholm because of scaffolding and picnics ruined by wasps. On top of all this, the promised rain was now arriving so we trudged back up the one mile precipitous ascent beginning to wonder if it had been worth the effort and the use of a couple of tankfulls of the world’s increasingly rare fossil fuel. Shortly after beginning our homeward journey, we came across a public, free parking area overlooking Slate Grey Bay equipped with public restrooms at the parking area and not one mile away downhill. Such is life. eat before or after the trip beside the lake because there appears to be no food along it. A four hour drive got us back to sunny Petaluma and very good Mexican taqueria, albeit without any lake views.